Book 1 guides you expertly through teaching the alphabet, then on to the first story. Kids love the included Phonics flash cards which can be cut out from the back of the book. Or you may prefer the Deluxe Flash Card set, which is printed on heavy duty card stock and suitable for busy classrooms. 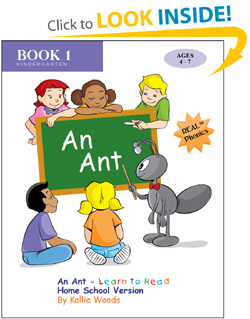 An Ant - Learn to Read guides you every step of the way with Teacher's Notes included on each page, so teacher and student can use the same book together. No prep time is required, just open the book and begin teaching phonics! The traceable Writing practice worksheets are a big hit with kids, and help to reinforce new words and letters. Extra copies are available for free download. Lessons begin slowly with only six letter sounds. New letters are added gradually, giving young readers plenty of practice and time to gain confidence. All you need is 5 - 10 minutes a day! By the end of Book 1, your students will be able to sound out 96 short vowel words. Get COUPONS and NEWS for REAL Phonics! We value your privacy! We will never bombard you with excessive email, or share your email address with anyone else. You will receive coupon codes from time-to-time that can be used to purchase books or flash cards. You may also receive notices when subsequent volumes of An Ant - Learn to Read become available.